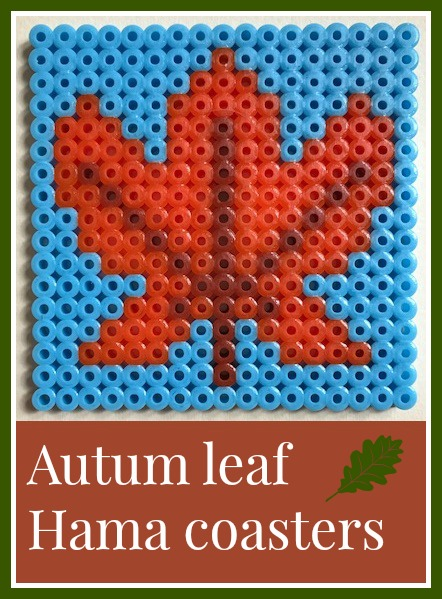 It's getting cooler outside, and with the children now firmly back at school my thoughts are turning to Autumn crafting. 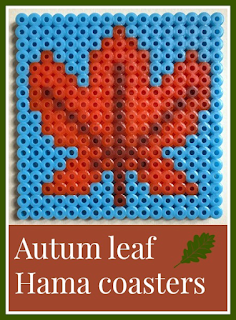 Last year I used my Hama beads to make some Autumn Hama bead battery candle holders which I was really pleased with, and so this year I've brought the Hama beads back out, this time to make some Autumn leaf coasters for those warming Autumnal drinks. Although the leaves are made using Autumn colours, I've also included some pastel blue and green. Even though the weather is turning colder, winter isn't here quite yet, and there can still be some lovely blue sky at this time of year! I came up with two different leaf designs and used a variety of different colours. I think they also look nice arranged into a square, a bit like my Hama bead Russian Doll tiled picture! They are ironed on both sides, and well ironed to make sure that they won't come apart. After ironing, I always place my Hama bead pieces between two cork mats and leave something heavy on the top for a little while to make sure that they cool flat, otherwise the finished project can have a tendency to warp. With Halloween approaching, you might also like my Halloween Hama bead coasters. Or I have also designed some Hama bead coasters for Easter featuring Easter Eggs. You can find all my Hama bead designs on my Hama bead page.